I am wearing this costume. I got the idea online. For the frame I used foam board and gut and super glued it in place, the base is a plastic bowl that I cut in half and glued elastic to so I could attach to my ankles so I could walk. 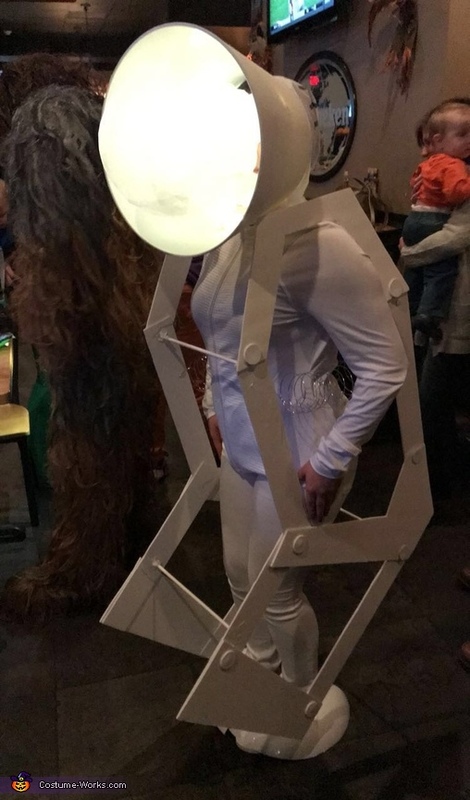 The head is a white lamp shade that I strung battery lights in, the light bulb is white mesh fabric that I used fabric stiffener to make into a globe shape, (seeing through it was limiting but i was able to walk around). the back of the head is fabric that i formed to my head and sewed to a headband. I painted the grey stripes with paint and put a little black switch/ knob with extra fabric painted black. For the bolts on the frame I used foam.